There’s a reason Zager guitars rate in the top 5% of acoustic guitars today. The minute you hold a Zager guitar you immediately feel Denny’s 60 years of research in designing a neck that feels good no matter what your hand size. Players say it feels “natural” like an extension of your body. It’s slim front to back allowing you to get your hand around it with ease. 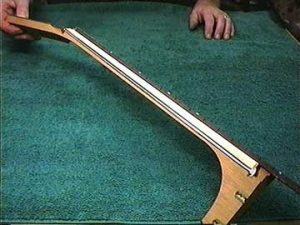 It’s also wide enough (but not too wide) so that with Denny’s custom string spacing you’re not leaning on adjacent strings creating buzzes and rattles. 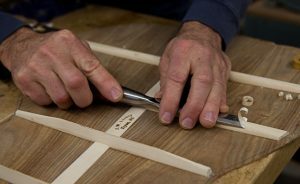 Any guitar builder can lower strings, very few can do it without buzzing and poor sound quality. Few players know that if string height is too low it destroys sound quality. 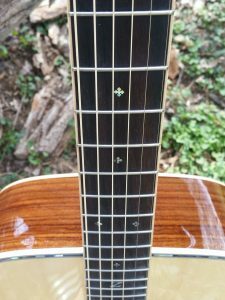 If you look closely at Zager guitars you’ll notice low string heights on frets 1-10 where players spend the majority of their time, but action rises over the sound hole for better tone and easier picking with the right hand. This also allows you to really get into it and play aggressively with no buzzing. Denny also incorporates a custom adjustment setting on his guitars so you can dial in string height specifically for your style of play. When you barely have to press to form chords it makes a world of difference in your playing whether you’re a professional player or just starting out. New players with no muscle in their fingers are all of a sudden forming chords with ease as 50% less pressure is needed to make chords ring true. Advanced players no longer have to “muscle” chords and are able to play longer sets with much greater speed and accuracy. Denny achieves this using a lighter bracing system which actually flexes in the face as you press each string. This also provides more bass and power as more movement in the face produces a bigger sound. Have you ever tried to form a chord and no matter how you adjusted your fingers they were leaning on adjacent strings causing buzzes and rattles? Denny solves this problem by using custom string spacing on his guitars. When you look at a Zager guitar you won’t even notice its spacing until you play it, but when you do you’ll immediately notice chords that were hard or impossible are easy. Just 1/32’s of an inch can make the difference between a chord that rings true and one that buzzes and rattles. 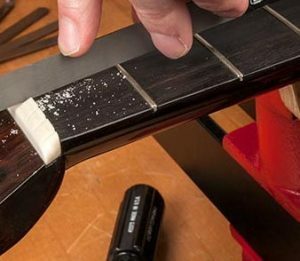 Denny designs his guitars with a string height adjustment setting that allows you to dial in your guitar to your particular style of play. In this way if you’re a heavy handed player you can set the action higher so you can “get on it” for more power, and if you’re a lighter handed touch player you can dial the action low for greater speed and accuracy. 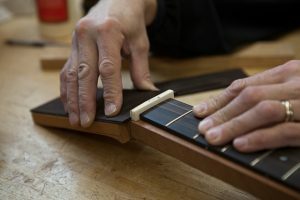 When you buy your guitar direct from the builder not only do you save money avoiding the middle man retail price mark up (usually about 50%), but quality control is higher because your guitar isn’t being sent through dealer networks going through multiple hands in the retail stores. 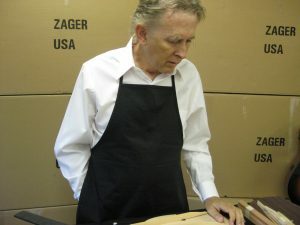 When you buy your guitar from Zager it goes straight from Mr. Zagers hands to you with a 100% money back guarantee.